There were some eggs that lived in a bowl. I have so many eggs! What do I do? I'll beat them and mix them and add them to bread. And turn them into comforting eggy bread! Eggy bread, ahhhhhh, eggy bread. It was exactly what I knew I had to make for End of Month Eggs on Toast Extravanganza, the Nursery Food edition, thanks to Cook Sister! 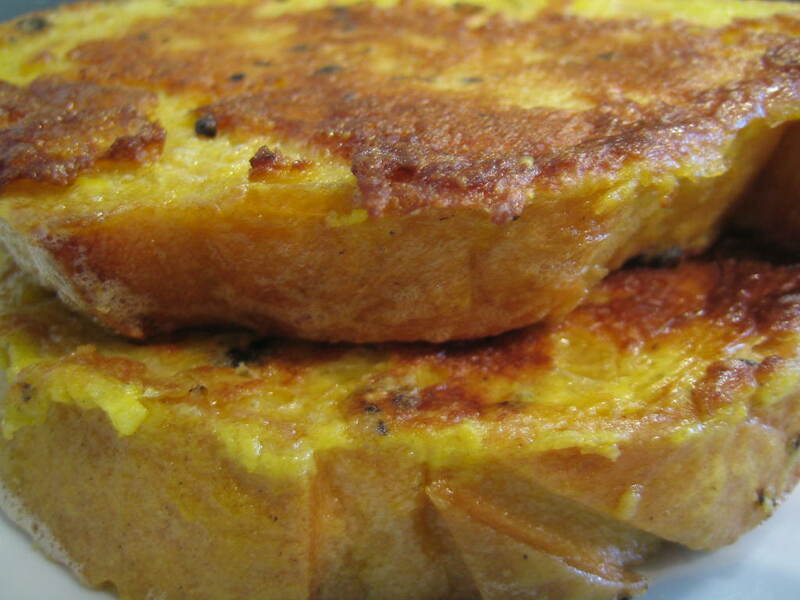 Eggy bread has many aliases : French toast, poor knights of Windsor, pain perdu to name a few. And also many variations : Croque Monsieur or mozzarella in carozza. But to me, to maximise the comfort level, I think this is a dish best kept simple. Eggy Bread is quick and easy to make, and is virtually impossible to ruin, even if your mind is elsewhere - is that not the benchmark for comfort food? Cut generous slices of bread from a good white loaf - sourdough is a particularly good choice, the less dense the bread the more it is likely to fall apart as it absorbs the egg. Beat some eggs with a spot of milk and salt and pepper. Heat a heavy pan to medium and add a bit of butter and a bit of olive oil. Dip the bread slices in the egg mixture, allowing it to absorb a good amount. Fry the now eggy bread until it looks lovely and golden. I like to eat this plain, but apparently HP sauce goes well. If you want to make it a bit more of a meal, a bit of bacon and some maple syrup goes brilliantly! Yes! We had eggy bread for lunch today and we made it the same way. We also put a light dusting of icing sugar on top. Delicious. Mmmm, eggy bread! This was always a real childhood treat. I liked mine with golden syrup... Thanks for your entry - roundup should be up soon!